I'm slightly confused about the direction full-sized adventure tourers are taking. I mean, who doesn't like motorcycles that are lighter, more powerful and more tech-laden. But do you really need all that techno-wizardry to go globe-trotting? That's a question I tried to answer last year when we took a bunch of ADVs to the rooftop of the world and admittedly, I had a blast. 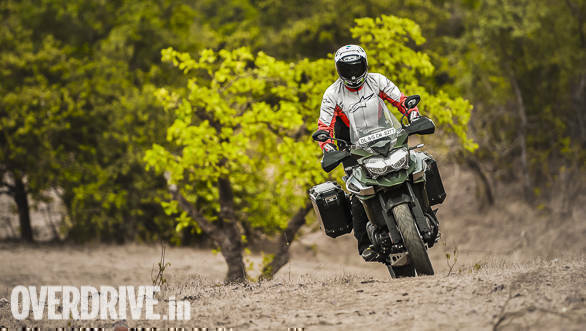 While the Triumph Tiger Explorer may not have topped the score sheets then, it did impress with its refinement, comfort and equipment levels. And just a year later we have a new version  one that has not only dropped a few pounds but also the Explorer suffix. 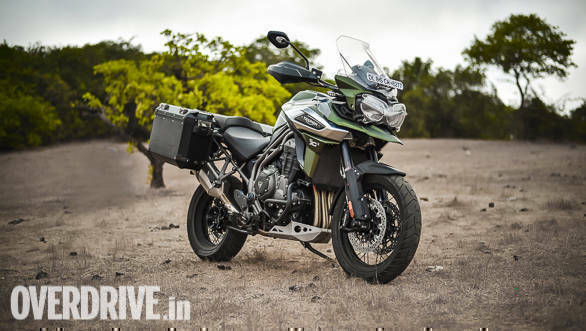 Needless to say, the 2018 Triumph Tiger 1200 also claims to be more powerful and get more technology, while retailing at a lower price. Really, Triumph? While I plan that ride to the hills again, here's a full-fledged road test of the 2018 Triumph Tiger 1200 XCx. The 2018 Tiger 1200 looks identical to last year's bike, which means the sculpted body panels continue to mask the bike's heft well. The Tiger 1200 decals on the tank are new though and look good. Visually, most of the mass is concentrated around the tank which makes for a beefy look, as is the norm with the segment. The electrically operated windscreen and deflectors haven't changed but the headlights are now slashed by strips of LEDs that function as daytime running lamps and look more modern. The piece de resistance though, just like before, is the single-sided swingarm held by a shaft drive. 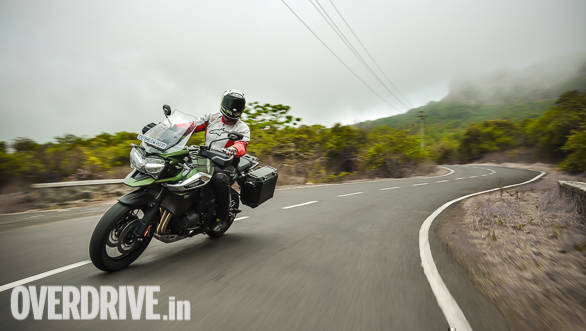 Our test bike came equipped with several accessories including a set of aluminium panniers that completed the adventure touring look, while the matte, military green colour added to the bike's appeal immensely. 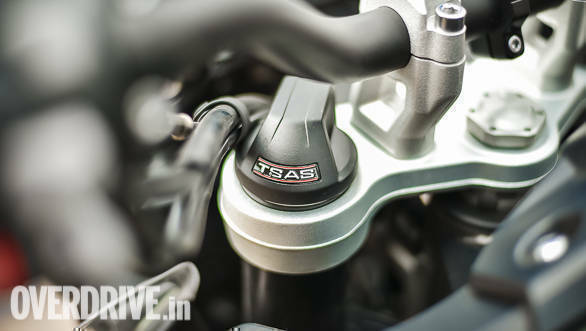 The TSAS or Triumph Semi-Active Suspension has been carried over and makes a world of difference to the way the Tiger 1200 rides and handles in various conditions as compared to conventional shock absorbers, but more on that later. 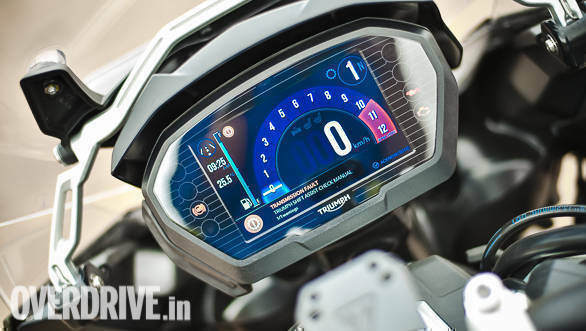 The 2018 Tiger 1200 also sports the same multi-colour TFT display as the updated Tiger 800 and Street Triple RS, and functions are accessed via a five-way joystick on the handlebar. The screen and joystick are pretty much your gateway to almost all rider aids, be it adjusting the windscreen or suspension or changing riding modes. For 2018 the Tiger 1200 XCx comes equipped with an additional Off-road Pro mode in addition to Road, Sport, Track and Off-road. Off-road Pro switches ABS and traction control off to offer better control off-tarmac, with practically no electronic intrusion. The six-axis IMU (Inertial Measurement Unit) has been carried over and studies the bike's position continuously in terms of its pitch, yaw and roll as also lateral, longitudinal and vertical acceleration. It works in conjunction with traction control and feeds power to the rear wheel accordingly (depending on the riding mode chosen of course) and also adjusts suspension damping every 10 milliseconds depending on the surface you're on. Pretty neat, since that means the electronics have your back all the time. The XCx also gets heated grips and heated seats and as we found out in Ladakh last year, they are a boon in cold weather. 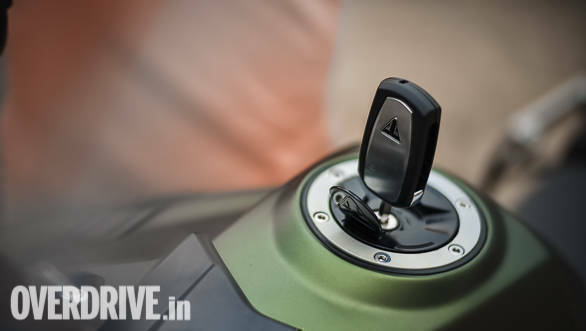 Another big addition for 2018 is the remote key fob, like the Ducati Multistrada 1200S and the BMW R 1200 GS. You simply carry it in your pocket  there's an unlock button on the handlebar and the fob itself has an ignition kill switch, without which you cannot start the engine. 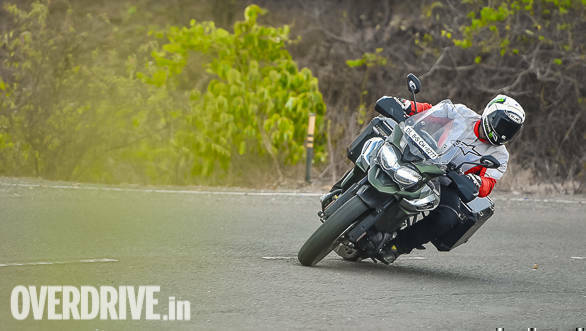 That isn't it though  the Tiger 1200 gets cruise control, a bi-directional quick-shifter, cornering ABS, cornering traction control and hill hold too! That is a lot of stuff indeed but, it all works well in saving your skin and also lets you ride this 141PS motorcycle like a lunatic. The 1,215cc, inline triple cylinder motor gets a few changes including a lighter flywheel and crankshaft. Power is up by 2PS to 141PS and torque is up by 1Nm to 122Nm. But more importantly Triumph has beefed up bottom end grunt to enhance rideability off-road, and I could feel the difference as compared to last year's bike, be it in traffic or off-tarmac. That said, peak power is produced at 9,350rpm and peak torque at 7,600rpm so you still have to wait for the engine to offer its full wealth. 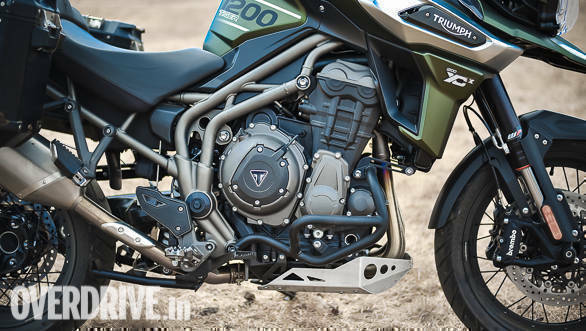 Despite Triumph's weight loss program (the XCx has lost 5kg) dry weight is a hefty 251kg, so you're looking at a kerb weight of well over 270kg considering the 20-litre fuel tank. Add luggage and you're hitting the 300kg mark, which is heavy! Despite its weight the Tiger 1200 managed an impressive 0-100kmph time of 5.1 seconds in our acceleration tests while 160kmph was dispatched in 10.34 seconds. What also stood out during full-bore acceleration runs was the more sonorous exhaust note thanks to the optional Arrow exhaust. The three pot motor could have been slightly smoother at lower revs  it feels refined at high speeds but I felt refinement could have been half a notch better at low speeds. That said, fuelling is precise which makes for excellent throttle control. This in turn makes for a very confident feel as you know the kind of response every throttle opening will induce. In fact, the precise fuelling coupled with the slightly peaky delivery makes the Tiger 1200 easy to ride at slow speeds without scaring oneself. Sustaining well over 100kmph is also a cinch for the big cat, which makes mile munching its second nature. The bi-directional shifter is effective but calls for some effort and lighter actuation would have been more welcome. Riding modes tailor the experience, though personally I preferred to stick to Sport on tarmac and Off-road Pro off it most of the time. 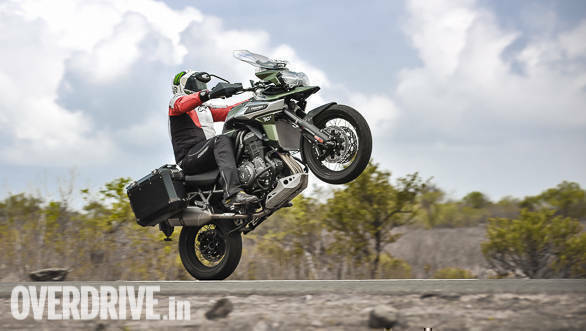 The semi-active suspension is the star of the Tiger 1200's show. It tailors the ride and handling package depending on the mode chosen and offers lots of confidence at all times. You can of course adjust the suspension manually via the onscreen menu. That said, I was left wanting for some more stiffness and have to admit the 19-inch front tyre also robbed me of some confidence when riding enthusiastically. 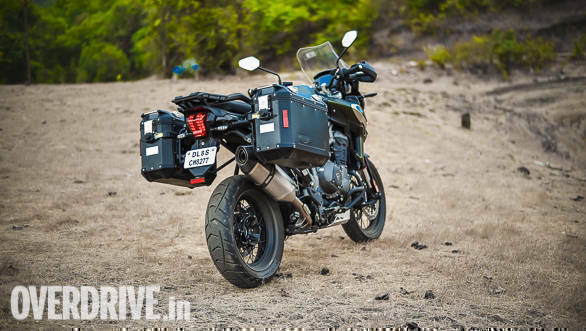 On the whole, the Tiger 1200 is an eager beaver on tarmac, but calls for some muscling it around due to its size and weight. The Metzeler Tourance tyres inspire confidence and let you delve deep into the bike's handling abilities by offering lots of grip at all times. Riding the Tiger 1200 off-road also calls for a bit of getting used to. Off-road Pro mode makes sliding on dirt look easy, but it takes a bit of effort to get past the mental barrier of power sliding such a large and heavy motorcycle on loose gravel. Once you get past that barrier the Tiger 1200 is a lot of fun though and can be immensely rewarding and also seriously quick. And while you're playing around, the semi-active suspension works over time to offer the best possible ride quality. 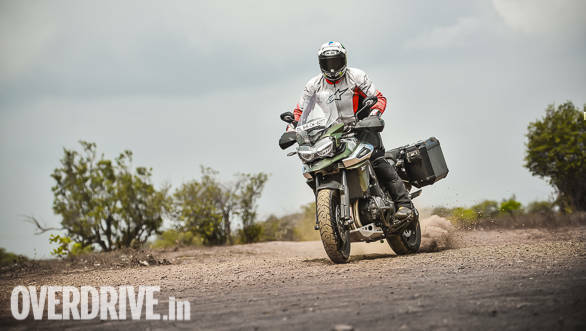 I am seriously impressed with the plush ride the Tiger 1200 offers on almost any surface, as the suspension's bump absorption abilities are excellent. The suspension also soaks up undulations well at speeds, thereby making for a plush ride and adding to its impressive highway manners. The wide and comfortable seat adds to the comfort  I had no trouble riding the Tiger 1200 for a couple of hours at a stretch, particularly thanks to the comfortable seat. Credit also goes to the impressive ergonomics, as the handlebar is now closer to the rider by 20mm. I suspect taller riders might find the 'bars a little too close when standing up on the pegs and riding though. The 2018 Triumph Tiger 1200 betters its predecessor various fronts, especially the rider aids and powertrain. Getting used to its bulk is still a bit of a chore, but look past the heft and the Tiger 1200 is immensely rewarding. The bigger highlight to me though is the fact that the Tiger 1200 now retails at Rs 17 lakh ex-showroom, which is almost 2 lakh rupees lesser than last year's bike that retailed at Rs 18.75 lakh. 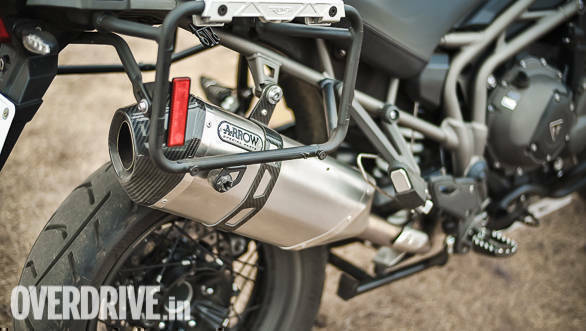 The improved abilities and lower pricing in fact bring the Tiger 1200 closer to its arch rivals, the BMW R 1200 GS and Ducati Multistrada 1200S. Time for that epic ride I guess.